Chibale recognised his need to further his education beyond a first degree. There were no postgraduate opportunities in Zambia at the time so he began applying for scholarships that would take him abroad. He made contact with Stuart Warren at the University of Cambridge in the United Kingdom, who agreed to supervise him provided he found funding. Chibale won a Cambridge Livingstone Trust scholarship and enrolled in 1989. Nonetheless, he found the environment there stimulating. The fact that his classmates were clearly ahead of him only served to motivate him to reach their level. 'You can moan and complain about how something hasn't been in your favour or how you've been disadvantaged, but you can also turn it around and use it as a challenge.' With the help of his supervisor, who understood Chibale's background and was prepared to work with him, and with the support of his friends, he quickly caught up and settled into the lab environment. Within three years, Chibale had finished his PhD without having done an honours or a master's degree. Even before he finished his PhD, he recognised that there was a long road ahead. 'I started thinking about and applying for postdoctoral research opportunities in the UK, Canada and the US.' He won a fellowship that allowed him to conduct postdoctoral research at the University of Liverpool, upon completion of his PhD. Thereafter he was awarded a second postdoctoral research fellowship that took him to Scripps' Research Institute in La Jolla, California. In his postdoctoral positions, he began to focus his interests. 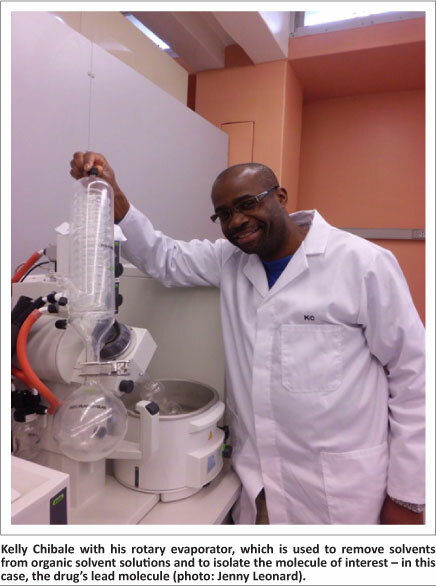 Chibale's PhD at Cambridge was in the field of synthetic organic chemistry. He worked particularly on synthetic methodology, developing methods for making chiral or optically active molecules. In Liverpool, he focused on developing methods for making optically active alcohols using asymmetric organolanthanide reagents in which a chiral organic molecule is modified by a lanthanide metal. At Scripps, he applied various types of methods strategically and creatively to assemble complex natural molecules from readily available building blocks, a process called the total synthesis of natural products. He decided that the place to make this new start would be Africa. Chibale contacted James Bull, then Professor of Organic Chemistry at the University of Cape Town (UCT). Bull had offered Chibale a postdoctoral position two years earlier. 'That was about 1994 and I was very nervous about the transition and the elections. I thought there was going to be a civil war. I didn't want to be caught up in that, so I decided not to come.' But, in 1996, Chibale joined Bull's department as a lecturer and quickly rose through the ranks. Chibale celebrated his 16th year at UCT in October 2012. He and his team of researchers at the Drug Discovery and Development Centre (H3-D) made this year memorable by discovering an aminopyridine compound (MMV390048) which has the potential to become a part of a single-dose cure for malaria. MMV390048 was used successfully to cure mice infected with malaria parasites and is active against an array of resistant strains. It is the first compound researched in Africa that has made it into pre-clinical development and is scheduled to enter human clinical trials by the end of 2013. If trials go well and the compound is successfully developed, it could be launched as a drug as soon as 2018. Chibale would like to encourage researchers to work on programmes that integrate scientists from different disciplines and expertise, and really make a difference in South Africa. 'We need to be able to show our leaders and the powers that be that while we can do the basic science, we can also apply this knowledge to dealing with real life issues. We need to give a positive message and publicise the value of science through tangible outputs.' He's not talking about publications. 'The public doesn't care about publications in scientific journals. But they will care about how science can change their lives.' He has inspired many by his discovery, and will continue to inspire us as he designs and synthesises the tools to create more innovative drug discoveries.